Posted on February 26, 2014 at 8:41 pm. Note: This January, Becca and Bill (friends) went to Washington DC to participate in Dance Exchange’s first ever Winter Institute. Check out Bill’s entry about the experience. Now that the Winter Institute has come to an end, Dance Exchange seems so distant, yet the experiences and the reflections of our time there are so close to home. As we begin to settle back into Edmonton and begin work with the GeriActors and Friends this winter season, we come in with a fresh mind, but more importantly, with many questions. Our journey with Dance Exchange started in May 2013 when two members of the company did a five day residency with the GeriActors and Friends. Our company was in an exploratory phase, looking for different prompts, styles, ways to discover and create stories. We knew the seniors still had many stories to share, but needed a new approach. Despite our initial impressions of dance: learning confusing and meaningless choreography and lamenting at how limited our bodies are, we were eager to experience this new form of storytelling when Dance Exchange came. By the final performance, everyone had soared through their choreography as the audience’s jaws dropped watching our 73 year old artistic director fly over a chair and then under it during our hour long dance performance. We realized that dance didn’t have to just be about learning choreography or showcasing flexibility, it became a liberating and visceral way of telling our stories. It was moving to see everyone open up as their narratives began to unfold; it was as if these memories were stored within waiting to be released. Click here to see a section from the GeriActors dance performance, “She’s asking for too much” performed by David Barnet (Artistic Director) and Shula Strassfeld (Dance Exchange), choreographed by Sarah Levitt. Fast forward six months, we’ve flown into Washington DC to attend the Winter Institute at Dance Exchange. Becca and I have had a taste of DX, but we still had many questions: What are the communities that they work with? What are their rehearsals like? How do they create and develop work? What type of facilitation methods do they use? As we began to meet the various artists, dancers, teachers, actors and facilitators who were to take part of this journey with us, we began to share our stories: where we come from, what we’re curious about and what we hope to accomplish. By the end of our two-hour potluck, there was a real sense of community, as this group of artists had realized that we all had come for one purpose: our love for art and the communities that we live in. The next three days became a whirlwind of ideas, questions, creation and dance. We started every morning with a technique class, where we spent an hour and half playing around with various ideas of dance. I emphasize ‘play’ because these were the moments I found I had the most fun. One moment I could be ‘tracing’ a senior from Maryland, the next I’m doing plies with a ten year old boy then suddenly I’ve got someone on my back flying around as if I have a jet-pack. On Friday, Liz Lerman the founder of Dance Exchange came in to facilitate a Critical Response Process workshop. To paraphrase this four-step feedback process, the idea is to allow both the artist and the responder to be able have a discussion through inquiry and questions rather than having a responder based dictation of their own ideas. I suggest reading Liz Lerman’s book called the Critical Response Process, which extensively walks the reader through this process. Perhaps the most significant aspect I took out of the workshop was how the CRP can be adopted into various situations in our lives. For example, Liz had us shake everyone’s hand and find something objective about each other to have a conversation about. We found that the way we touch, our degree of eye contact, the distance between us and even the way we said goodbye shaped the conversations and the impressions we had of each other. The feedback we had from these cues ultimately defined the entire experience. I realized that if we really thought about the feedback we gave and received in our day-to-day lives we could open ourselves up to more meaningful interactions and conversations. An interesting detail I picked up while observing Liz speak, was how she always started her sentences with “It’s interesting that…” whenever there was a comment that startled or confused her. In a way, I feel like I’ve witnessed Liz’s internal feedback: rather than beating herself for not knowing, she framed this moment of not knowing as an opportunity of discovery. I find this inquisitive frame of mind extremely grounding, a lesson I will also begin to adopt into my own practice. 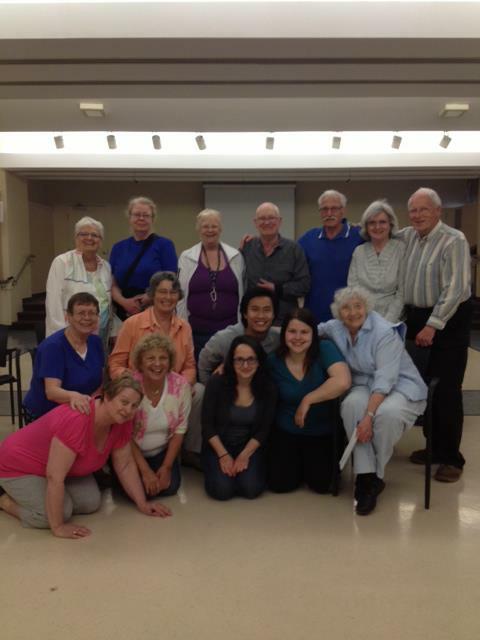 On Saturday we facilitated a workshop at Arcola Towers, a seniors’ centre on New Hampshire Avenue. The experience was invigorating, eye opening and heart-warming; all the elements of the GeriActors. The biggest difference for me was the level of social and cultural diversity in the room. This intergenerational group of people involved youth from a high-school program called Identity, seniors from various cultural and age ranges, middle aged facilitators from Dance Exchange and caretakers who all participated in the workshop. I was astounded by how all the perspectives and stories came together to create a collective “movement-collage” by the end of the workshop, it was so pertinent and inclusive, a defining feature of intergenerational art. So now that we’re back in Edmonton, this question, “Okay, now what?” has resided over my mind for the last few days. We’ve taken a glimpse of the realities of community and senior arts in Washington DC, we’ve experienced and facilitated approaches to telling stories through dance, we’ve utilized discussion and dance to explore some of the questions we carried with us… so now what? How can we take this whole experience and make it pertinent to the work that we do with seniors in Edmonton? How can we take these methodologies developed through dance and apply it to theatre? How can we better collaborate and learn from various artists in our communities and around the world? These will be the questions that guide us as we begin working this next season. Posted on February 18, 2014 at 10:38 pm. At the final symposium of FEST 2013 we began discussing ways we could make our work more accessible to the community. How can we be more inclusive? How can we reach the seniors who aren’t necessarily ‘active’ in the community? What methods can we use to achieve this? We realized that in order for this to work, the discussion could not longer be exclusive to June and at FEST, that we would need to continue this conversation throughout the year. We hope this blog honours that intention, as we share highlights, discoveries and questions facing the GeriActors and Friends through our process of creating theatre about intergenerational issues. If you or someone you know is interested in senior issues, community art making or intergenerational theatre keep posted on this blog! We will be updating you on upcoming G&F events and would love to hear what you have to say. All are welcome in this discussion, and we hope these entries will be the beginning of a larger conversation. Please feel free to comment below on this post and any future posts.